We had a great day out at Bako National Park on Thursday last week. We set off early to get to the park before the hordes arrived. After a van ride to the pier, we caught a small boat to the actual park. We landed on the gorgeous beach and after a brief wait at the Park HQ set off to Telok Pakou. The trek was quite hard work, climbing up steep hills and through rainforest, after crossing a mangrove swamp by raised walkway. We had soon worked up a good sweat. As we walked, our guide pointed out Proboscis monkeys, which we heard fighting before we saw them. These are the animals that most people go to Bako to see. Proboscis monkeys are famed for their large noses (in the males) which grow as the animal ages, and which is used to attract mates by honking. We saw several groups as we trekked and watching the shy creatures move through the trees above us was a magical experience. Eventually we reached the beach at Telok Pakou, where we rested while watching a group of Proboscis’ who tend to gather nearby during the morning. After that it was back to the HQ along the same route, again encountering Proboscis monkeys, and also long-tailed macaques, sun geckos and two wrangler pit vipers, which are very venomous. Because the Proboscis monkeys are so shy, I didn’t get a decent photo of them, which is a shame. After lunch we headed up to the view point above Telok Assam where we had landed. The Orang Utans for which the centre is famed are fed at 9am each morning and we arrived in plenty of time. Before we made our way to the feeding area, an adult female and a juvenile where playing around entertaining the visitors in exchange for some fruit. We then went to the feeding platform and the park ranger called to the Orang Utans. After 5 minutes two arrived, swinging through the trees, and a little later another two turned up. We watched for around an hour as the apes picked up bread and fruit left for them on the feeding platform. It was great to see such beautiful creatures living in the wild having been returned to the forest from urban environments where they were previously held captive. The Rehab Centre also houses some crocodiles and turtles, as well as having a veterinary centre which was looking after some gibbonswhen we visited. There are also some gibbons living wild in the park which you could hear whooping as you walked through the trees. A great place with a fantastic atmosphere. Lots of photos taken at Bako and Semengoh naturally. On Sunday we caught the shuttle bus to the Holiday Inn Resort Damai beach, where we were booked for the following week. This was supposed to be our big treat, a week in a resort with beach etc. There are two Holiday Inn resorts at Damai; the Damai Beach and the Damai Lagoon, and guests staying at one can use the facilities at the other, with a free shuttle bus between the two. Have to admit the Damai Beach was a bit of a disappointment. We had booked through the Holiday Inn website but the hotel seemed to have no record of our booking when we arrived. We sat in the lounge for more than half an hour with no sign of anyone coming to confirm that we had a room. We got a bit bored so went back to reception who said that they were waiting for someone to bring a fax over from the other hotel. So we booked over the web, the hotel has internet access, but they needed a fax to confirm that we had a room. Technology seems to have passed the business processes of the Holiday Inn by a decade or so. Our room was way up on a hillside above the main hotel centre, with a free shuttle bus on request. Spectacular views of the mountains from the balcony of the room, and plenty of space in the room. No in-room internet access here though; RM12 gets you an hours internet access on one of the three terminals in the reception area, though there may also be wireless access at the same rate down there. The service in the hotel restaurant was a little woeful, involving long waits, cold food, limited selections and (relatively) expensive buffets. The staff were all very friendly but didn’t seem to get the whole service thing in the ways that the Thais seemed to. The information on the web indicated that the Holiday Inn Kuching and Damai Beach had gym facilities. In the case of Kuching this actually consisted of a room with two running machines and two exercise bikes. The rest of the gym had been converted into a massage centre. At Damai Beach there are no gym facilities at all. The facilities are at the neighbouring Damai Lagoon. The gym there has a couple of treadmills (not powered running machines), a bike with no working resistance control, a stepping machine with no controls at all, a weights machine and some hand-weights. Despite being disappointed with these, we gave them a good go and actually quite enjoyed the work out. By Wednesday, almost a week after visiting the hospital, I was feeling much better so we booked a day out at Bako National Park starting at 7:30am the next day. This is one of the best places in Sarawak to see the elusive Proboscis monkey, famous for their oversized noses, who also featured on the cover of Pigbag ‘s first album sleeve (but not on the CD re-issue). We were booked in to the Regal Court Hotel in Kuching. The hotel is quite a distance from the waterfront and tourist areas of Kuching, and is close to a main road. I was feeling tired so caught up with some sleep while Vic went out to scout the area and check out suitable alternative accommodation. On returning she had found an internet cafe (the hotel didnâ€™t have internet access, despite a large sign to the contrary outside) and booked us into the Holiday Inn Kuching which was at a much better location. My tiredness had changed to an aching lower back so we didnâ€™t venture further that day. The next morning, Wednesday 13th, we moved to the Holiday Inn Kuching, with a room looking over the river. The hotel has wireless broadband in all rooms for RM15 per 24 hours, which was pretty good value. Sadly the connection we used seemed to be very poor, losing 5% of packets resulting in painful web access speeds. We had a walk along the riverside and visited some of the attractions in the town including the Sarawak Museum. On advice from someone at the British Council we headed for the Normah Clinic a private hospital just outside Kuching. We were dropped off in the Accident and Emergency section and within minutes were talking to a doctor. He referred us to a consultant urologist and after an hour or so waiting we were talking to the urologist. I donâ€™t imagine that the same would have happened in the UK, even at a private hospital. By the time we were seen by the consultant, he had the results of a urine test already. He checked me out with an ultrasound scanner and checked a few other vital signs, but couldnâ€™t find any sign of kidney stones or growths which were two possible causes of my symptoms. He diagnosed that the problem was caused by a urinary tract infection and prescribed a course of antibiotics. He also submitted another urine sample for culture-growth and said he would email us with results. We then went through to pay. We had insurance which would cover any expenses beyond the excess of Â£40. We were pleasantly surprised to find that the total fee (doctorâ€™s consultation, sample processing, consultant fee and medication) came to less than Â£40. I hate to think what that would have cost me in the UK (or US). Weâ€™ve since found out that Malaysia and Thailand are both destinations for medical tourism, and thereâ€™s even a regular shuttle bus from the Holiday Inn Kuching to the Normah Clinic. Iâ€™m pleased to report that the antibiotics have improved things considerably, and though not 100% yet, I have managed an hour in the gym. We caught a cab to KLIA for our AirAsia flight to Kuching in the Malaysian province of Sarawak. Our baggage was its usual excessive amount, and this time AirAsia decided to charge us for the excess, RM10/kg. Weâ€™ve had the same amount of luggage for a while now and the only time we have been charged excess was in India when flying with Air Deccan. Not a great start to our journey, given that weâ€™d had to get up at 6am to pack and catch the taxi. KLIA was clean and bright but nothing terribly exciting, certainly the domestic end of the terminal was the usual dull airport fare. The flight was uneventful; not too long but not a lot to see out of the window due to cloud cover. Arriving at Kuching Airport we had to fill in another Malaysian immigration form (identical in every way to the one we filled in when arriving in Malaysia the previous week) and then caught a cab to our hotel in Kuching using the pre-paid taxi counter. In our last days in KL we did a bit of shopping, both in Suria KLCC under the Petronas Towers and at BB Plaza in the Bukit Bintang area. At the former we found an excellent bookshop, Kinokuniya , which had a great selection of English books and magazines and one of the next selections of computer books Iâ€™ve seen anywhere. They even had the Apple hardware manuals in stock. Better than the selection in Borders on Oxford Street in London. We’re now in KL, having caught a ferry to Surat Thani, a minivan to Hat Yai and then flown here from Hat Yai all over a period of three days. We’re staying in the rather plush (and expensive, for us) Renaissance Hotel with a fantastic view of the Petronas Towers. On Sunday we visited the Skybridge which links the towers on the 41st and 42nd floors. Sadly, you can’t normally go to the top of the towers (which have 88 floors). Tomorrow we’re flying to Kuching in Sarawak (part of what was known as Borneo) for a couple of weeks. We got up early on Friday and caught the ferry over to Samui. The power had been off in the whole of Haad Rin from 9am until 7pm on Thursday, and it looked like the same might happen again on Friday, hence we decided to avoid another sweaty day with no fan or water and do some last-chance purchasing. We picked up a more recent copy of Private Eye and some other mags, some bits and pieces from Boots and Vic bought some more clothes (mostly exercise gear). We missed the 4pm boat back so had to wait until 6:30pm for the last boat. It got quite windy but nowhere near as bad as last week. We’d missed the gym opening hours so will have to make up for that later. After some Italian food in Haad Rin we walked back to the bungalow and got ready to settle down and relax. It was then that Vic spotted a spider on the curtains. 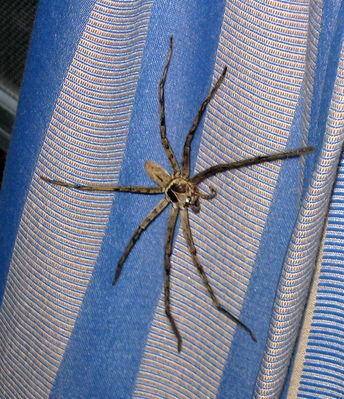 Not just a spider, but a HUGE spider! It must have been 6 inches across and had nasty-looking fangy-bits. After a degree of panic and “what the heck are we going to do?”-ing we managed to manouvre the beast out of the window by showering him with drops of water. Much relief as he leftthe room and we shut the mesh screen behind him. We just hope he doesn’t decide to come back in. As I spend all my time using the Mac offline, I’ve been playing with a few of the applications that come with it. One of these, which I hadn’t really used before, is the Dictionary. Nothing exciting about a dictionary, you’d think, but this one combines a dictionary with a thesaurus and an encyclopedia. It even has pictures for some entries. For example, Vic and I were trying to get out heads around how the various US states are laid out, and I found that the dictionary entry for “United States” has a map of the US with all the states marked. It has simple maps for quite a few other countries. Another neat feature is the ability to double-click on any phrase or word you don’t understand and you get taken to the entry for that word or phrase. Similarly you can double-click on a picture to see an enlarged version of it. Hours of harmless fun! I’ve no idea whether the Dictionary has improved in Tiger as I didn’t really use it before, but it’s very useful now.